It was through the Golden Gate that royal suites used to enter the representative Długa Street long ago. The arch was constructed in 1612-1614 in the style of the Renaissance with visible Dutch and Italian influences according to the design by Abraham van den Blocke. Phrases chiselled on both sides of the gate are its characteristic feature. The frieze on the front wall contains a fragment of the Psalm No. 122: “May they prosper who love you. Peace be within your walls and security within your towers”. The Latin inscription on the gate facing the Długa Street says: “Consent builds little republics, dissent ruins great ones.” Gate walls are decorates with stylized fruit, vegetables, cones and other Dutch motives. 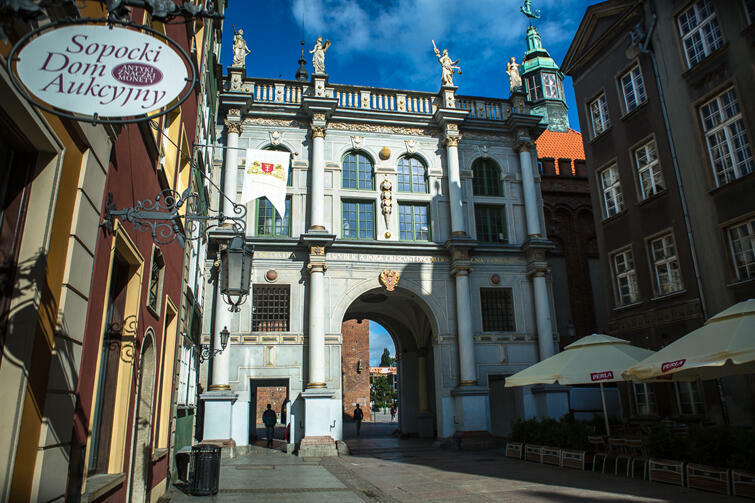 Additionally, the western side of the arch is decorated with the coat of arms of Gdańsk. The name of the gate comes from the gold plated carved details glittering in the sunlight.